We have had fantastic weather in my part of the UK this weekend and I’ve been busy. I hope your weekend has been great too. Yesterday I go up early and prepared for some voluntary work in the cemetery then did two hours work. I was clearing grass and weeds away from the stones and carrying the waste to a bin nearby and my two friends were writing down the inscriptions from the memorials so we could add the information to our website. I think I must have jarred my neck in doing the work because it’s been feeling a bit uncomfortable ever since then. In the afternoon I did some work on my Story Box. I have to have a story box completed by next Saturday, several of us are making them to show as examples of how people can use archives to tell a story. My box is about a theatre that stood in the town from 1813 until 1961 when it burnt down. One of the things I am putting in the box is a small book containing all the newspaper items that we have found. I think there must be hundreds of them, it seems like that anyway. I have typed them all out using a Old Newspaper style font, printed them, aged the paper by soaking it in tea and now I am tearing around the edges of the typed items, distressing the edges of the paper and sticking them in the book. This is just to give the ‘feel’ of ageing, I’m not trying to pass anything off as antique. The ageing with tea took all yesterday afternoon! Fortunately the weather was good so I was able to do most of it outside and didn’t drip tea all over the kitchen, that would have driven my husband crazy. I worked on the tearing, distressing and sticking all evening but didn’t complete the job. I started today by doing some updates to the RSHG website. Then we drove over to the Garlic Farm to pick up some garlic bulbs for T to plant in the garden and to the big hardware store to picked up some items he needs for a project he is working on. As it was such a beautiful day today I thought I would take Mum and Dad out for a drive and a walk this afternoon. Dad however said he would rather stay at home and watch the football on tv so must Mum and me went. We went to the village where I grew up and found the grave of my paternal great-grandparents in the church graveyard then we went for tea in, what I always thought was, a posh hotel. Surprisingly the service as abysmal and Mum complained about it! This evening I’ve been doing more tearing, distressing and sticking and I’m still not finished! As well as the book I have loads of stuff to print out to add to the Story Box which has to be completed by Saturday morning and I’ve got to presentation to prepare too. I’m feeling just slightly under pressure right now. I may not have time to post again until next weekend, so, in the meantime, I hope you have a great week. 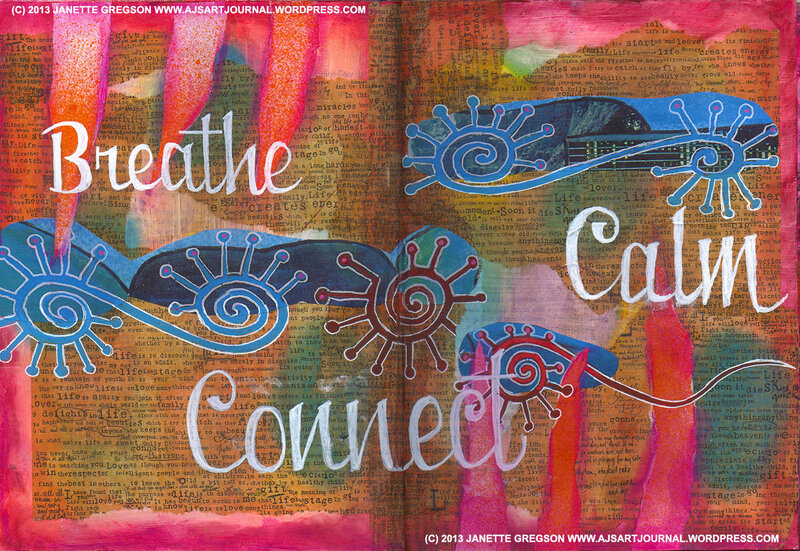 This entry was posted in Journal 4 Altered Book and tagged AJ, AJ art journal, art journal, Breathe, Calm, collage, connect, Doodles, mixed media by ajsartjournal. Bookmark the permalink. Now that is a busy weekend – and you even had time to write this blog – that’s amazing. Hope your neck feels better soon and good luck with the Story Box – sounds a lovely idea.